I wanted to put the border up at the ceiling to help make the ceilings look taller and I had to decide just how wide I wanted it. So how did I get this look? It was really simple. The entire project took me one afternoon. Next I pre-painted the wall color over the seam of the frog tape. I have orange peel wall and the texture is notorious for paint seepage. Sealing the tape with the wall color has always helped with that. I needed two coats to cover the pink, and when I peeled up the tape I was THRILLED with the fact there wasn’t a single area that required a touch up. At this point I loved it so much, I considered just leaving the scallops (if you are considering this wall treatment, leaving a scallop border is a simple (less than 2 hours) project. Plus this isn't my only Shape Tape™ project. 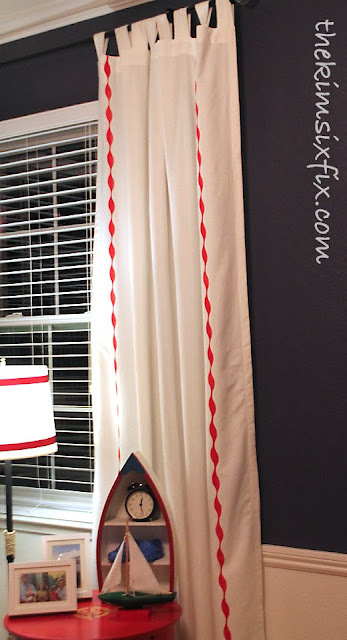 I have used the "wave" pattern on these stenciled curtains in the baby's room. And recently used it here when stenciling a some burlap I made into patriotic stars. I think it is a great product, and encourage you to follow FrogTape® on Pinterest or Twitter to be inspired by all the amazing things you can do with it. Do you have ideas for what you would do with Shape Tape™? Seriously cute Kim!! I am certain the girls are gaga over it :-) I will be looking for the tape for the guest bedrooms! I love how the fake eyelet came out, and the changed window curtain really works too. This is such a cute idea, I love the way it turned out!! Love it Kim. It looks so delicate and girly. I am loving this stuffs!! Totally pinning!! Thank you so much @Evelyn @ My Turn for us! Ha! Yeah, I don't think my husband would dig it in his man cave, but perfect for little pre-tween girls! Thanks @Jeannie Clemens. I totally agree. It helps the border be the star of the show. That shape tape is awesome! Love the difference it made in the room! Thanks Sara! I totally agree! 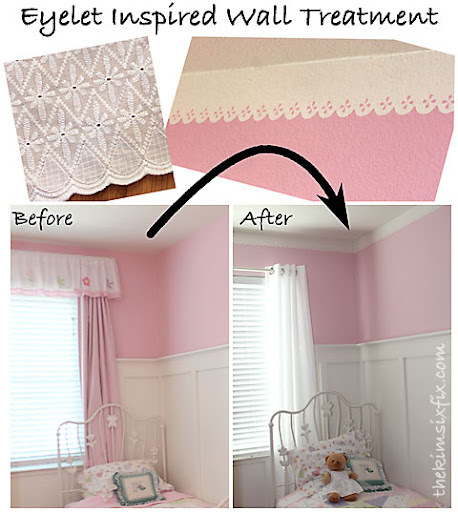 The lace boarder really made a difference to the room. It looks lovely. Wonderful job. Love, love, love eyelet lace - this border is gorgeous! Nice job, Kim! This is exquisite! PERFECT for a little girl's room! And I do love some frog tape! Oh my, this looks amazing! I love it! Oh my how cute! What a great idea and that tape is awesome! OBSESSED!!! <3 It looks so good. I'll definitely recommend this to my friend who's got a little girl that turns one on Friday. I'm so impressed!